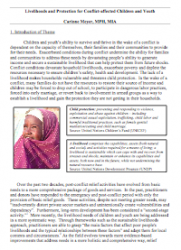 This paper encourages an integrated approach to programming which includes components that address both the livelihoods and protection needs of children and youth in post-conflict situations. By examining integrated livelihood interventions, through rigorous evaluation, these programs have shown an increased protection for youth and children. This paper provides a working understanding of the conceptual and practical link between livelihoods and child protection in order to strengthen the connections between the two fields and to inform future programming.